AKIPRESS.COM - The United States Agency for International Development (USAID), in partnership with the Uzbekistan Ministry of Health and the Republican Scientific and Practical Medical Center of Tuberculosis and Pulmonology, officially launched the Center for Innovative Distance Training and Monitoring in Tashkent and its regional satellite office in Bukhara. Established with support from USAID, the Center for Innovative Distance Training and Monitoring will contribute to the professional development of medical workers and provide clinical consultations and mentoring, both onsite and remotely, to TB healthcare professionals as well as students of academic medical institutions across Uzbekistan. The opening ceremony was held at the Republican Specialized Scientific-Practical Medical Center of Tuberculosis and Pulmonology in Tashkent, the U.S. Embassy said. USAID through its TB Control Program provided technical assistance and supplied video-conferencing, information technology, and office equipment to support the center. This will allow physicians at the Center for Innovative Distance Training and Monitoring in Tashkent to conduct online medical consultations with their colleagues at Bukhara Regional TB Hospital to share knowledge and exchange clinical expertise in order to more accurately and quickly diagnose and treat TB. The Center also will also serve as a distance training facility for medical personnel at regional TB institutions. Prior to receiving this equipment, health providers had to travel hundreds of kilometers to Uzbekistan’s capital for clinical consultations and training. Additional satellite branches of the Center will be opened in other regions of Uzbekistan and will effectively link TB professionals across the entire country in a network providing access to training and shared decision-making that will improve the both the quality of and access to TB services. In addition to establishing and equipping the Center for Innovative Distance Training and Monitoring, USAID has supported training and study tours of TB experts from across Uzbekistan to Rutgers University Global Tuberculosis Institute (USA), the World Health Organization Collaborating Centre for Research and Training in Management of Multidrug-Resistant Tuberculosis (Latvia), and to the National TB Training Center of Excellence (Tajikistan). “The Center for Innovative Distance Training and Monitoring will become a leading institutions for the professional development of healthcare providers and students by providing access to the newest approaches on TB prevention, detection, and treatment. This contribute to the common goal of reducing the burden of this disease in Uzbekistan,” noted Gary Robbins, USAID Central Asia office Director in Uzbekistan. 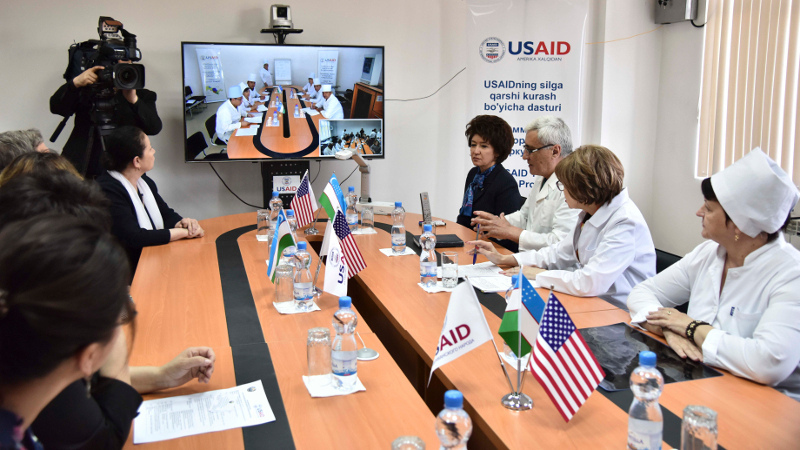 The United States through USAID support Uzbekistan’s efforts to implement its National TB Program and provide more effective and accessible TB prevention, diagnosis, and treatment for all, including vulnerable populations. The main objective of the five-year, $7.6 million USAID TB Control Program is to reduce the burden of tuberculosis in Uzbekistan and prevent multidrug-resistant forms of the disease. The program includes a wide range of activities, including training health care workers to strengthen the health system, improving interagency coordination and cooperation, and increasing access to TB diagnosis and treatment.